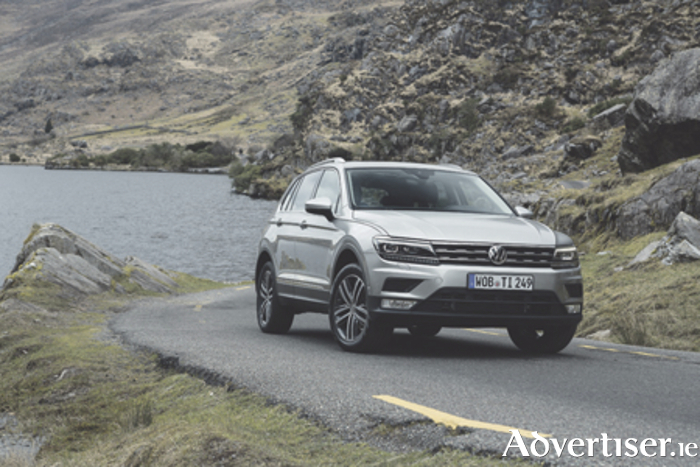 Volkswagen’s all-new Tiguan has been proving a hit with Irish buyers and critics alike since it arrived earlier this year. And now Volkswagen is offering a new entry-level diesel for the Tiguan with some stunning 171 offers. The new 115bhp 2.0-litre TDI engine for the Tiguan is likely to become the favoured choice of Irish Tiguan customers. This new engine has a starting price of just €30,985 excluding delivery and related charges (or €29,985 if customers order on PCP before December 31 ). The Tiguan range starts with the 1.4-TSI petrol with 125bhp from €29,085, and there are 2.0-litre diesel engines with 115bhp and 150bhp, with the range topped by 2.0-litre diesel engines with 190- and 240bhp. There are three grades of Tiguan: the Trendline, Comfortline, and Highline. Plus on the Comfortline and Highline grades, there is the option of choosing the increasingly popular R-Line styling package, which until December 31 is half price. This pack normally retails for €2,860 on the Comfortline but is yours for just €1,430. But the savings don’t end there - choose a Tiguan Comfortline or Highline, and you can have 3.9 per cent APR from Volkswagen Bank which will save you over €2,000 in finance costs compared to high-street lenders. With the 171 Premium Upgrade Packs for the Tiguan, you can upgrade the specification of your Tiguan for a fraction of the price of the individual items. For example, in the Comfortline, you will receive the Mirror Package, Keyless Access, Panoramic Sunroof, Discover Media Satellite Navigation, Voice Control, and App Connect. This pack is valued at €3,189 but is yours for just €999, saving you an additional €2,190. “The Tiguan, we feel, is the most premium offering in the segment and now customers can get into the Tiguan with even greater added value,” said Volkswagen Passenger Cars Ireland Brand Director Gerrit Heimberg. Tiguan offers are available right across the range and for all retail customers who order before December 31. Contact one of the team at Michael Moore Volkswagen, Athlone on (090 ) 6403444 for more details.